I have no artistic skills, so it was surprising how much I enjoyed paint night last time enough to try it again. 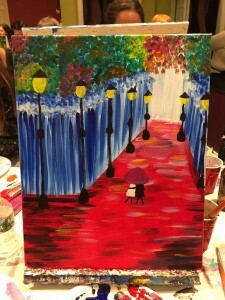 Paula, Erin and I descended upon Paint Bar in Newton and this is my attempt at Lover’s Lane. It was going well until the lampposts – I’m horrible at drawing straight lines. Next time I am going to pick a painting with no straight lines. Afterwards, we went to Cook, conveniently located right next door. The menu is eclectic, ranging from udon noodles to shrimp tacos and flatbreads. 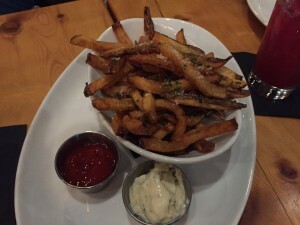 We shared some truffle fries; they were crispy, dusted with parmesan and came with a nice rosemary aioli for dipping. 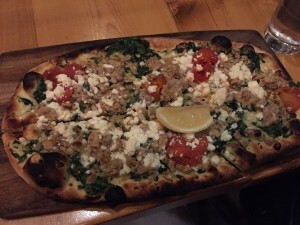 I had the Mediterranean flatbread (chicken sausage, creamed spinach, roasted tomatoes, feta, $15). The crust was thin with a satisfying chew and even though I thought creamed spinach on a pizza was weird, it worked pretty well. The flatbread was generously sized. Erin’s fried chicken was a winner – 3 large pieces of dark meat chicken with mashed potatoes, slaw and a biscuit. I got to sample the chicken (it was excellent) as well as the biscuit (tender and flaky). It was a bargain at $18. Paula’s burger ($14) looked appropriately medium rare. It came with more of the tasty fries. She seemed to enjoy it. Cook feels like a great neighborhood joint - definitely check it out if you are in the area.